Kenya is now the more favored destination for investment by global technology companies, a position which has long been attributed to South Africa. IBM, Microsoft, HP, Motorola were all attracted to South Africa when the country got rid of apartheid. These companies established local offices in SA meant to serve markets across sub-Saharan Africa. 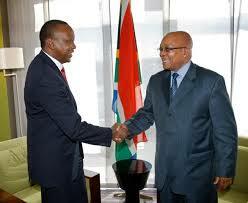 South Africa which was then seen as a gateway to the African continent is now yielding this position to Kenya. IBM for instance chose Kenya to host its research laboratory in Africa, with other such facilities located in US, Switzerland, Israel, Japan, Ireland, India, China, Brazil and Australia. IBM Research Labs have produced several inventions responsible for advances in IT. With their Kenyan facilities, IBM Research aims to solve problems in the African sphere through applied research. During his visit to Africa, Google’s Eric Shmidt also acknowledged Nairobi’s position as a technology leader in Africa. Microsoft also chose the country for its white spaces project. Several Kenyan technology companies have also transformed themselves into Pan-African brands with Cellulant and Seven Seas Technologies being notable among them. Kenya products are also service as international case studies, an instance is the success of M-Pesa which is used to facilitate daily transactions in the country. With its Kenyan success, MPesa has also been adopted in India and Tanzania. Ushahidi, is another success story from the country which helped to deliver aid during Kenya’s disputed election in 2007. The Kenyan government has taken up remarkable projects to enable ICT industries in the country. At an estimated $14,5bn, the Kenyan government is creating Konza City, an initiative meant to attract investments from international technology companies to the country. Konza City will sit across a 5 000-acre site 60km south of Nairobi. Kenya has also made significant steps in policy making with its ICT master plan and the Cybersecurity framework. Kenya may yet establish its position as a new ICT leader.